Calvin Trillin once wrote that the average Italian restaurant gets more customers in a day than the average Indian restaurant gets in a month. ELV — the man, the myth, the yogurt-yogi-spiritual-advisor — used to agree with him. These days the tables have been turned (somewhat) and from the lines out the door at Mint Indian Bistro, it appears the Indians (dots not feathers) are giving the Italians a run for your money. 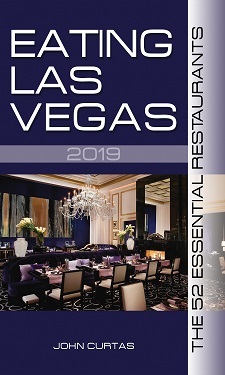 ELV also thinks every vegetarian restaurant in Vegas is a joke. They should all close up shop immediately, and every vegetarian in town should start frequenting this place instead. From those crowds that pack this place every day and night, we at ELV think our advice has finally been taken to heart, and our generation’s favorite food writer might be wrong (for once). Despite the name, MIB, heads you straight to the Himalayas—where classics dishes like momo dumplings and chau chau await. It’s really a Nepalese restaurant with some vindaloo here and a Himalayan there, making it Las Vegas’s own master of all sub-continent cuisines. Think of it like a Middle Eastern place that holds no allegiance to any one country, but rather, seeks to expose you to flavors and techniques shared by a number of neighbors. Thus can you enjoy a southern Indian dosa (crispy savory pancake) that could double as an umbrella—a paper-thin umbrella, which comes laced with lip-searing chile powder along side s northern Indian Baingan Bharta (mashed, roasted eggplant). Not so assertive, but equally lip-smacking, are those momos—stuffed with ground turkey, they are probably the subtlest things on the menu, but no less addictive for it. The staff is exceedingly friendly and helpful to novices to this cuisine (who isn’t? ), and they take your order on their iphones—how cool is that? They’ve even kept a bunch of European and subcontinental beers on the menu— a legacy leftover from the restaurant’s previous incarnation. The abstruse differences between northern-Indian and Nepalese cuisine may not be readily apparent to anyone but Max, but anyone in love with the soups, stews, and curries of the subcontinent, will find precious little to complain about after one of these highly-spiced meals. For the record, yours truly (who considers himself a major league chili head) got through three bites of the lamb “Inferno” before he had to call it quits. For the record #2: a bhut jolokia pepper weighs in at over 1,000,000 Scoville Units; a jalapeno, by way of contrast, measures around 15,000. Try it at your own risk, and have several mango lassis standing by. Favorite Dishes: Samosa Chaat; Bombay Aloo Curry; Chau Chau; Momos; Chana Masala; Rogan Josh; Vertical Vindaloo; Baingain Bharta; Tandoori Chicken, Lamb; All Dosas; Mango Masala Curry; Northern Indian Tasting Menu; Southern Indian Tasting Menu; Nepalese Tasting Menu; Anything with “Tasting Menu” in the title; All vegetarian dishes; Basically everything on the friggin’ menu. Interesting. Not to get too critical, but while I like both Mint and Nakamura-Ya, I can’t rate either as essential. I liked Mint better when it was Himalaya, but I understand the rationale for the change, and since it’s still open for business, I can’t argue with the result. The old Nepalese for the American hemisphere menu with swordfish and turkey versions of their food was so damn ballsy, and delicious, any serious gourmand both had to be in awe of what they were trying to accomplish even as one wondered how long it could possibly last. In any incarnation, though, their momos are outstanding. I also enjoyed Nakamura-Ya, and I’d be happy to dine there again, but I wasn’t so impressed that I’m dying to get back there. I’m more a fan of the concept than the food. No argument that it’s a good restaurant, or that it’s not way beyond the typical Eye-talian joint in town, or whether or not it rates above anything in Tivoli Village or “Downtown Summerlin”, but for myself, there are still a pile more places from which I hear a stronger siren call. Still nice to see some places that are good and get overlooked get some love, though. Keep churning them out.